Night School is directed by Malcolm D. Lee. The film stars Kevin Hart, Tiffany Haddish, and Rob Riggle. Teddy Walker dropped out of high school in the early 2000s, but life has been going good, as he’s dating the beautiful Lisa, who he plans to marry. While Teddy’s barbeque grill salesman job pays considerably less than Lisa’s corporate job, he gets the good news he’ll be inheriting the business when the owner retires! But a mishap derails Teddy’s future plans, and he’s forced to attend night school with a colorful group of people and a sassy instructor so he can get a sales job with an old friend. But it quickly becomes apparent passing the class will be more difficult than Teddy ever anticipated, and it doesn’t help that the school’s principal is someone who Teddy bullied long ago. Will Teddy be able to keep it a secret from Lisa he’s got to attend night school, or will his plans come crashing down? Kevin Hart, Tiffany Haddish, and Rob Riggle are all hilarious. Seeing that they were uniting for one movie seemed like comedy gold, but alas, it was not meant to be. 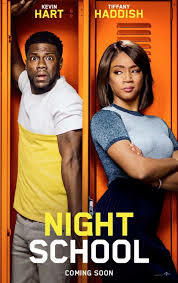 Night School has a formulaic plot, lazy writing, cheap gags, wasted potential, too much of certain characters and not enough of others, and the characters the movie does choose to focus on are one-dimensional and boring. The movie does have a few funny moments, but if you’ve seen the trailer, you’ve already seen the best of what the film’s got to offer. The stars do the best they can with the material they’re given. But despite half a dozen writers, very few of the gags stick. 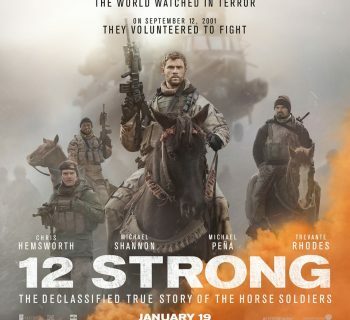 They deserve a better movie than this one. As is, the plot simply goes through the motions. Kevin Hart and Tiffany Haddish get a few solid one-liners, but everyone else feels like they’re simply going through the motions. Despite Teddy being engaged to Lisa, she’s in the movie surprisingly little. Another wasted character is Teddy’s wisecracking and insulting sister, who also is barely in the film. The night school class is, essentially, one-joke characters who wear out their welcome surprisingly fast and only have a handful of laughs throughout the movie’s frustratingly-long 110 minutes. The lazy writing emphasizes physical gags and cheap, juvenile jokes. The result is a lack of consistency, with one of the biggest offenders of this being someone who falls of a rooftop and is severely injured… only to be back in the class with no injuries whatsoever almost immediately thereafter! Hell, even if they’d put him in a cast afterwards, it would be slightly more believable. A subplot of Teddy working part time at a Christian Chicken establishment shows initial potential but is basically cast aside and never lives up to what it could have been. Several scenes at the “night school” are clearly filmed during the day. Teddy tries to hide that he’s going to night school from his wife-to-be… we know how things like this go in every single movie. It’s a generic, paint-by-numbers plot, and it simply isn’t that funny. One can’t help but wonder if Night School would have worked better as a television sitcom than a feature film. The writing is lazy, and it wastes a brilliant cast of comedic talent. You’ll probably chuckle a few times, but save yourself about two hours and just watch the trailer instead. Most of the “good stuff” is there. Rating: One star out of four. DISCLAIMER: All images in this review are the property of their respective copyright holders, including HartBeat Productions, Will Packer Productions, and Universal Pictures. For promotional use only. All rights reserved. 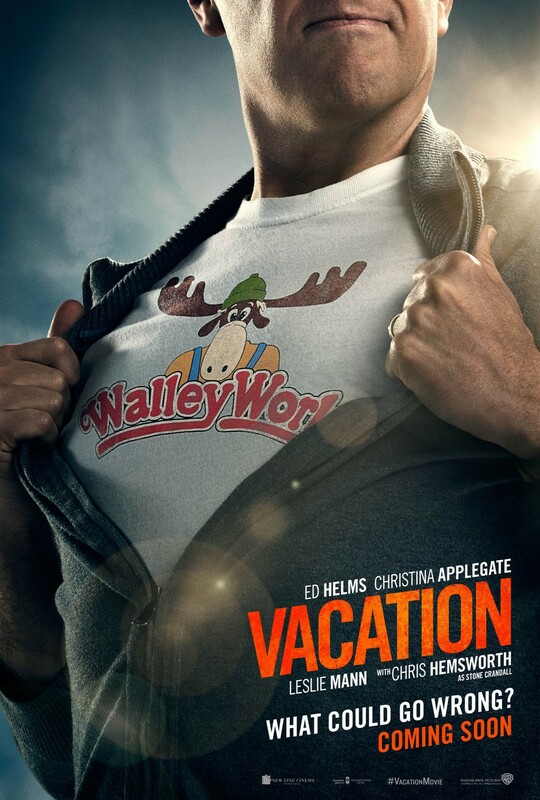 Vacation - This Trip with the Griswolds is Definitely Not One to Go On! A Simple Favor - Odd Hybrid of Suspense Thriller and Witty Comedy Impresses! Unexpectedly Yours - Filipino Romantic Comedy Drama is Unexpectedly Entertaining! 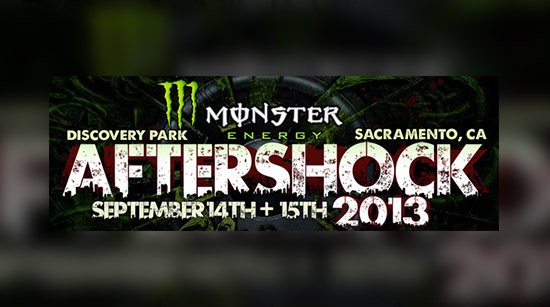 Alex Cole - The Bad Boy Rocker Finally Headlines in Vegas!